A super gentle cleansing balm that softens and soothes whilst cleansing and balancing both oily and dry skin. I am delighted with this cleanser. I use this cleanser primarily as a makeup remover and yes, it takes it ALL off. I’m a heavy mascara user, so I smooth on half a pea size on each eye and really massage it in, than I use a dab on forehead, each cheek, chin and mouth area. It does not irritate my eyes at all and does not blur my vision!! I leave it on for about 10 minutes and than wipe off with warm water and microfiber cloth. I have also used it for general cleansing of the face and neck and sometimes I use it as a balm for my face and neck as well! So triple duty! The scent is divine and the texture is luxurious. And for this years BC winter, you can’t go wrong. Living in Alberta, especially in the winters, really dries out my skin, so this cleanser is perfect for me. Really cleans the skin and I like that you can leave it on for 1 minute or 10 minutes. It is great for all skin types as it is not heavy (for oily skins) but can be hydrating by leaving it on longer (for drier, more mature skin). Really takes off the make up and mascara! Love it! Helena’s cleansers have become my favourites! This is a wonderful cleansing balm and feels soothing on skin. I love how my skin feels thoroughly cleansed yet still hydrated. I have both this one and the lavender lime one too so I can alternate between them as I choose to. Facial skin is left with a lovely glow after using. Never in a million years would I have ever thought an oil cleanser would work for my combination skin. I was wrong. This cleanser is the absolute best I have ever used. EVER! I love the fact you can order a sample kit to try out first. Great product and superior customer service. I love this cleanser. It gets off all the makeup, including mascara. I can’t believe it’s oil based but not at all greasy. It makes my skin feel so soft and smooth. I love it!! Love this cleanser. It took 3-4 months for my skin to adjust but now I use hardly any but get great coverage. Leaves my skin feeling soft and supple. The best thing that’s happened to my skin in ages….. the whole idea of of oil- cleansing & this particular cleanser…… my skin is singing & so am I. My old acne marks are responding well & the skin is generally well on its way to recovery. 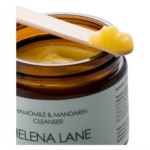 I’m obsessed with all of Helena Lane products but the cleanser is probably my favourite! So glad I found her products! I love all of Helena Lane’s products! I have been using them for over a year and my skin has never felt (and looked!) better. She is amazing! I’m in love with this cleanser – its texture, smell and results on my skin! Absolutely divine! Removes all makeup and leaves skin feeling soft and hydrated. Currently on my second jar and loving it! I was reluctant to try an oil cleanser thinking it couldn’t possibly clean my face properly. Boy was I wrong. My skin is prone to be on the dry side, especially during the cold months. This cleanser not only removes makeup, it’s very gentle and leaves your skin beautifully nourished and hydrated. Love it! I never considered cleansing with oil-based products until I was introduced to Helena Lane skin care. My sensitive skin feels nourished and balanced. I look forward to using this product daily. I’m not looking back! Love the cleanser. It makes my face feel clean and moisturized at the same time. I love this product the best. I agree, “get cleansing right and everything else falls into place”. This product removes all my makeup, even my mascara. My skin feels so soft after washing. I’ve never been one to stick with a face routine until I discovered Helena Lane products. My skin in the past has always felt dry or the same. My skin is now soft and hydrated all the time. And they are Canadian Made and do not contain toxins like more cleansers. I love that since I have chosen Helena Lane products to use on my face, this first winter has not affected my skin as it has in the past. I use to have dry, flaky and itchy skin every winter but using this skin routine and this particular moisturizer it has made my skin soft smooth and hydrated. Awesome results thus far! This is an amazing product! It’s my first time using an oil cleanser and I’m hooked. I love how good my skin feels and that I can use it to remove my eye makeup without any risk. I also love that I use fewer products and less of them. It was love at first use with the Chamomile & Mandarin Cleanser! It’s so gentle and yet removes any makeup or sunscreen 100% and leaves your skin feeling so soft and dewy after removal – no more dry, tight skin as with traditional cleansers. I’ve tried other oil cleansers, but the consistency of this one is far superior. It’s more like a balm, which makes for easy application and let’s it soak in. I’ll be multiples, so I have zero risk of running out! I orinigally got this cleanser as part of a gift pack for my birthday. I loved it so much I bought it and all the other items that were in the pack and also sent a gift pack to my mother in Nova Scotia. The cleanser is so lovely. It takes off all the grime from the day no matter what I was up to. It cleans thoroughly while still leaving my skin feeling soft and healthy, not stripped. Love love love it. With my Dutch fair skin and my Dutch lack of skincare, this cleanser has been a life changer. Following my friend’s advice I’ve started to cleanse my face every morning and I’ve noticed how my skin is calming down. Afterwards I apply the Frankincense mist and I’m good to go. Obviously I skip some days, as I am not very strict in my routines, but still using this product at least 5/7 days a week I feel clean and awake and healthy with less dry skin and less spots. Hooked for life. I’ve been using this a year now. I love how it cleans and doesn’t make my skin feel dry and stripped after. If I’ve been in the sun a lot or dry winters I need moisturizer after, but far less than I’ve ever needed and my skin is smoother and healthier looking in my 40’s than it was in my 20’s. 5 stars. Repeat purchase. Love the simplicity of all natural ingredients. Feels great. Not harsh & no dry, tight, stripped feeling after use. I purchase and use it as routine cleanser but tried it recently as make up remover and it was very good for that application as well. Love that its made in Canada. Love that its all natural. A little goes a long way. Highly recommend. I ordered the sample size of this product & pretty much immediately ordered the full size before it was finished – love this cleanser! You only need a tiny bit per use, it removes makeup nicely, feels a bit like a moisturizing mask while I let it sit for a few minutes, and so my face feels nice & moisturized after washing but not greasy. Will definitely be ordering again and again. I LOVE all my Helena Lane products but this cleanser is my favorite. I use it as a makeup remover and face wash. It even removes my mascara and waterproof eyeliner. I have been using my products for about 4 years now and my skin has never looked and felt so good. This cleanser is the icing on the cake. A MUST for me. This is the best cleanser I’ve ever used, it not only removes makeup but it also nourishes my skin leaving it hydrated and glowing. This cleanser transformed not only my skin but my entire outlook on skincare. For decades I struggled with hormonal acne and (like most) tried every harsh facial wash out there to try to “rid my skin” of it’s oily buildup, only to make the problem worse. Oil cleansing with Helena’s products taught my skin how to work for itself again. I now very rarely have a breakout, and I look forward to washing my face! I like this cleanser, very nice smell. I’m getting use to putting on the cleanser then taking off with a warm face cloth, I’ve never used a product like this prior, I feel my face is softer:) 5 stars for this product! I look forward to facial cleansing with this product. It is gentle and emollient effectively cleansing my skin whilst enriching it also. I love the scent. At the end of your day, take a pea sized amount and massage into a warm damp face. Leave for 2-20 minutes (can be used as a mask). Remove with a warm damp cloth. If you are removing lots of dirt or make-up you may need to repeat. Follow with floral water and serum, or leave your skin as is.